The Simmons Waterproof Mattress Pad is a Beautyrest® mattress pad which offers you outstanding comfort while providing long lasting protection. It is stain resistent where waterproof backing provides protection from spills. The BioShield® allergen inhibits growth of odor causing bacteria. Also it features SmoothGrip® skirt which fits 13 inch deep into mattress. The Waterproof Mattress Pad provides latest technology in quiet, breathable protection unlike other vinyl waterproofing mattress pads. So protect your expensive mattress from leaks & spills and sleep with comfort. The Ultimate Waterproof Mattress Protector - Full Size has many exciting features for users of all types. 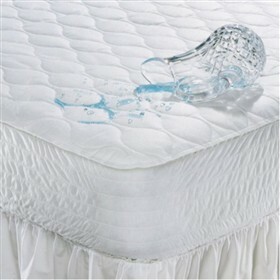 The Ultimate Waterproof Mattress Protector - Full Size is sold as a Brand New Unopened Item.